Another great chase day! We were presented with a dilemma in the morning between two chase targets, the "SPC Recommended" warm front up in southwestern Kansas, and the dry line play in southwest Oklahoma and into Texas. Leaving Oklahoma City, we were torn over the targets, though quickly information came in from Dr. Dave who strongly favored the area of Childress, TX. As we headed west, it was clear that there was a great deal of shear through both target areas as a large field of convective roll clouds were clearly visible from the ground, on satellite, and even on radar. About half way to the Texas border we committed to the Texas target, believing (correctly as it turned out) that the storms up in Kansas would be a large, messy cluster of cells, while the RAP model, which had been pretty much dead on all tour, developed a massive, relatively isolated supercell near Childress. As an aside, the Kansas storms also ended up developing quite a bit farther north than expected, firing all along I-70 from Russell to Salina. If we’d gone for the Kansas target we’d have been some very unhappy chasers. We stopped for lunch in Shamrock, TX, and then headed south, targeting the Wellington area, but before we got there, the dry line quickly fired and soon we could plainly see several towers with developing anvils to our west. We headed west out of Wellington towards Memphis, stopping about half way there to watch the storms develop. The storm in front of us to our west became the dominant one, with a large rain-free updraft and a pair of long inflow bands feeding into the storm. As the storm developed, it was very slowly tracking to the northeast but as it increased in intensity it turned to the east, and then eventually to the southeast. We were able to stay in our position watching the storm develop for about half an hour before the lightning threat got too great and we needed to get south to avoid getting cut off. We also wanted to keep an eye on the next storm to our south, which didn't look as good on radar but had an unimpeded path of inflow air from the southeast, whereas our storm was in danger of getting it's inflow path severed by the storm to the south. We went through Memphis and started heading south and now the storm was rotating wildly, with numerous shear funnels and mid-level funnels developing then dissipating. Continuing the theme of this tour of structure and dirt, the storm had a terrific corkscrew updraft and was ingesting an incredible amount of red dirt entrained in the inflow that was streaming into it. We stayed with the storm as it tried to cycle up a wall cloud, driving directly along the low-level inflow jet with flying dirt, tumbleweeds, and other debris. We proceeded south to Rt. 86, passing just south of the mesocyclone as it demonstrated rapid rotation and stopped to watch as the storm tightened up. There was now 3" hail reported with the storm and we were in danger of getting pounded by the hail core so we charged east towards Estelline trying to beat the core there. Though we didn't get the really big hail, we did get pounded by golfball sized hail and got two more spiders on our already broken windshield, while the lead van re-broke the just recently repaired windshield. We blasted south on FTM 658 to stay out ahead of the storm. We were now directly in between our storm and the southern storm, which was quickly becoming an absolute monster supercell. Interestingly enough, though that storm was developing a well defined hook echo, it was not tornado warned, while ours was. As our storm seemed to be cycling down, we started thinking about targeting the southern storm. 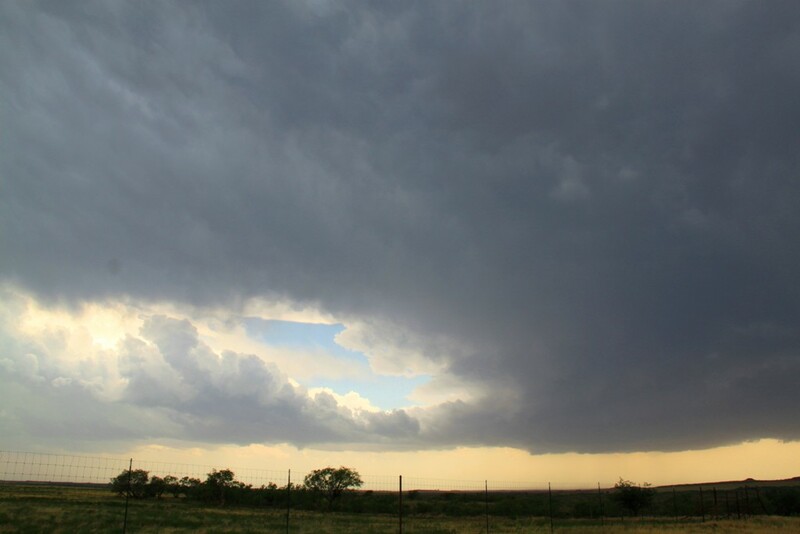 We stopped for a moment west of Cee Vee, TX and had a great view out on the open scrublands, but the storm looked like it was weakening significantly. We went through the small town and then headed south towards Paducah, but our storm intensified for one last gasp and had great structure one last time before the updraft sheared over literally before our eyes and the storm collapsed. That made our decision easy as the southern storm had become a beast of a supercell, showing velocity couplets on radar of well over 100 knots and reports of huge hail. The problem was we were now northwest of the storm, i.e. exactly on the wrong side of it, and with hail and velocity markers like it was exhibiting, there was no way we were going to attempt a core or hook punch as it would have been way too dangerous. As we headed down Rt. 83 with the rear flank of the storm's hook echo just about 10 miles to our southeast, we observed multiple significant lightning-induced fires on both side of the road. Heading into Paducah, the sight was pretty eerie: There was a giant plume of red dirt suspended in the air just east of town, and the town itself had clearly suffered some significant wind damage, with limbs broken off trees, sheet metal roofing blown off buildings, and debris all over the place. 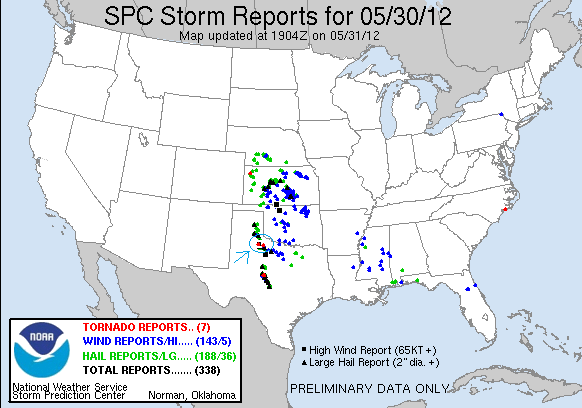 One spotter report suggested 100 mph rear-flank downdraft winds or a potential landspout tornado has caused the damage. Sure enough, as we exited the town, a long ropey landspout tornado with a red debris fan was visible on the rear flank of the storm and remained for a minute or two before it dissipated. Whether that was what hit the town or RFD winds I don't know, but my guess would be RFD damage. Still, that was tornado number 5 for the tour. Having cleared Paducah, we were still cutoff from the inflow notch of the storm and were forced to continue another town south, down to Guthrie. While we could still not see into the inflow notch of the storm, the mammatus clouds hanging out of the anvil were absolutely spectacular. Getting to Guthrie, we had a new challenge. We had 30 minutes to get east to Benjamin and were 36 miles from the town, which was doable, except that we were also down to about 1/4 of a tank of gas, and absolutely could not risk having a fuel issue with a potentially killer storm bearing down on us. There was no fuel in Benjamin or Guthrie according to a search on the smart phone that took an agonizingly long time because of the continuous data issues we were having, but we found that to the south of Benjamin there was a little town called Knox City that had gas, and as it turned out going southeast would buy us a little time to get out in front of the storm and present us with great road options, so we took a farm to market road to Knox City, gassed up, and headed northeast toward Munday. Just outside of town we stopped to witness the breathtaking structure of the storm off to our north with incredible striations wrapping around and multiple long inflow bands streaming in. One thing that can never be truly documented on film is the way these monster storms just take over the environment for miles around the storm. As far as we were away from the updraft, the inflow at our backs was still blowing into the storm at 40-50 mph and it was almost possible to lean backwards and be held up by it. We stopped again east of Goree, looking right up the inflow notch where there was probably a rain wrapped tornado in progress, but the notch had wrapped up to the point that you could no longer see anything. Interestingly, if we had been sitting at the exact location we'd been at two days ago on FTM 1919, our view up the notch would have been just about perfect. Finally, it was getting dark and there really wasn't much point in staying out ahead of what was now a large HP hail storm, so we headed up Rt. 277 through Seymour towards Wichita Falls, witnessing a terrific lightning show and a blood red sunset caused by the Sun setting with tons of flying debris still suspended in the air. After dinner in Wichita Falls, we raced up towards OKC trying to beat the derecho that had formed out in front of the Kansas storms to the city. We didn't quite make it and got hit with heavy gusts of wind just as we got to the hotel and observed several power flashes as we approached the town, but the show there was just about over and, arriving at the hotel, we called it a night. Torn between targets north in Kansas and south in Texas near Childress, we bucked the SPC preferred Kansas target and went Texas. Here we intercepted our target storm between Wellington and Memphis,TX out in the scrublands. BTW, the Kansas target was a complete bust.. Inflow band forms to the southeast of our developing storm. Storm develops a nice lowering off in the distance. Shear funnel. 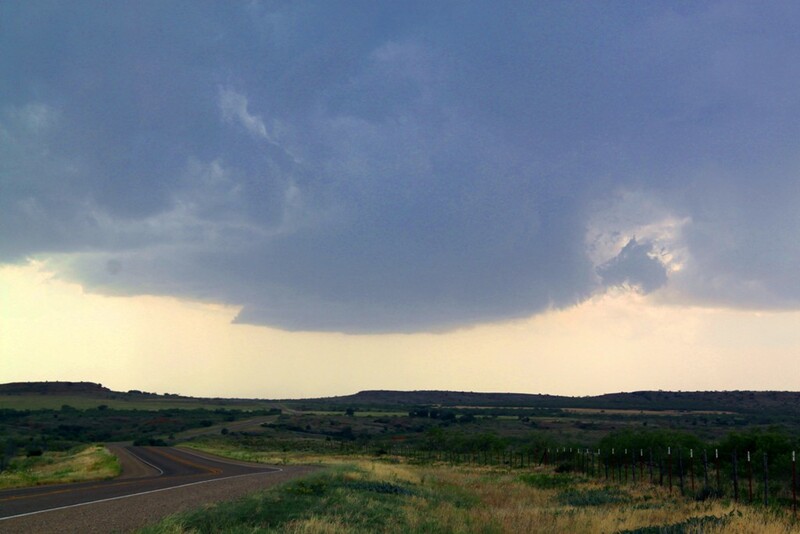 This storm produced numerous shear funnels and midlevel funnels as we chased it south. Another mid-level funnel. Funnel ropes out. Storm takes a classic supercell look just north of Rt. 86. Lots of dirt entrained in the updraft. We were positioned right under a big inflow band pulling air into the storm. With us right under the inflow jet, we got a serious dirt bath from all the dust getting sucked into the storm. Slluuuuuuuuurp! STRONG inflow! The storm was pulling in so much dirt visibility was near zero! We blasted west just under the violently rotating part of the storm.... ... then turned around and blasted east into Estelline, TX trying to beat the hail core into town. We didn't quite make is as we put 4 more cracks into our van's windshield. Still, we managed to stay out in front of the really heavy stuff. Now south of Estelline on FTM 658, AWESOME rotation right over the vans! A pause in the action as we stopped south of Cee Vee,TX to take a look. Our storm to the northeast here was looking worse and worse, while the storm to our south was becoming a monster supercell. We decided to blow off our storm and charge south to try and get in front of the southern storm, but then our storm decided to cycle up one more wall cloud. It eventually fell apart and we committed to the southern storm that was now tornado warned and bearing down on Paducah. The problem was we were now northwest of the storm, which was showing huge hail and violent rotation so we dared not punch the core, so we had to try and get around it. As we headed down Rt. 83 towards Paducah, we started seeing signs of the damage our target storm, whose rear flank was just about 10 miles southeast of us, was doing. We saw multiple lightning induced fires like this one. Paducah had all sorts of wind damage that appeared to have happened just a few moments before we got there as there was still plenty of debris flying around in the air, and we caught a glimpse of a landspout tornado just east of town as we went through. Metal panels blasted out of this storage building. Another lightning fire. This one appeared to have hit the power transformer in the background. We passed through Guthrie and headed east, desperately looking for a gas station, especially since we were now just about out in front of the storm. Fantastic mammatus clouds on the anvil. Closer view. Finally out in front of the storm and looking north towards this amazing rotating updraft near Munday, TX. Rear flank with mammatus clouds hanging from the anvil and the Sun beginning to set. Rock-hard rotating updraft. Here comes the notch of the storm, totally wrapped up. There was probably a rain-wrapped tornado in there somewhere, but we had no way to safely check it out.